Hello friends. Brrrr, it's cold here, extra blanket on the bed tonight! I have a cold, no fever, just a bad cold, nose is running like a faucet! I made a card today for the January Challenge at Craft a Scene. 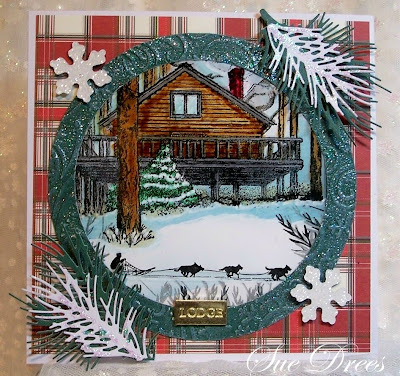 The theme for this month is "Snowy Cottages. Stamps - Cabin - Stamp-N-Doddle, sled dogs unknown, bought it unmounted, sorry. Snowflakes and background paper is Reflections from Michael's Star Dust stickles. Colored with Copics. Sorry about your cold, they are no fun whatsoever! Your card is awesome,I so love the dog sled image and combined with the cabin and all is quite stunning! This is one of your best ever Sue-I just love it!!! what let you show me now!! amazing card. beautiful scene. and colorwork. I like this card!! really beautiful!! I am just blown away! This is so amazing! Absolutely stunning! What a beautiful scene and I love that you embossing that circle. I, too, love that boughs and they are now a must have. The plaid paper is just perfect. Whenever I think of a cabin I think plaid. Enjoy your weekend. Wow.... This is gorgeous Sue! Fabulous card. me again...I hope that you cold is getting less and that you not goining to be ill. get well! you now what I find about the card, that is so beautiful done...but I forgotten to mention...thank you for joining at craft a scene. Super winter scene Sue and I really love the dog sleigh image. Thanks so much sharing with us at Craft a Scene challenges month.